Many people find it a daunting task to host a traditional holiday meal. I love cooking, and although it is a huge chore, I prefer to host. Mainly because I take pride in my turkey, and going back to a flavorless dry turkey is sad. I appreciate it so much more since the day before Thanksgiving 2010 I got injured and spent 4 days in the hospital. People thought they would be nice and bring me turkey-day left overs, but it was almost as painful to eat it than my injuries. I was released the Saturday after Thanksgiving and on Sunday I walked my husband and mother-in-law through how to cook the food my way. It was amazing! Luckily I make a ton of butter compote and keep it in my freezer because you never really know when you might need it, and so that was already ready for them. Sure starting the process 2 days ahead of time might seem exhausting, but I promise you it is worth it! Many people find it a daunting task to host a traditional holiday meal. I love cooking, and although it is a huge chore, I prefer to host. Mainly because I take pride in my turkey, and after trying my moist and flavorful turkey to a flavorless dry turkey is sad. I appreciate it so much more since the day before Thanksgiving 2010 I got injured and spent 4 days in the hospital. People thought they would be nice and bring me turkey-day leftovers, but it was almost as painful to eat it as my injuries. I was released the Saturday after Thanksgiving and on Sunday I walked my husband and mother-in-law through how to cook the bird my way. It was amazing! Luckily I make a ton of butter compote and keep it in my freezer because you never really know when you might need it, and so that was already ready for them. Sure starting the process 2 days ahead of time might seem ridiculous, but I promise you it is worth it! 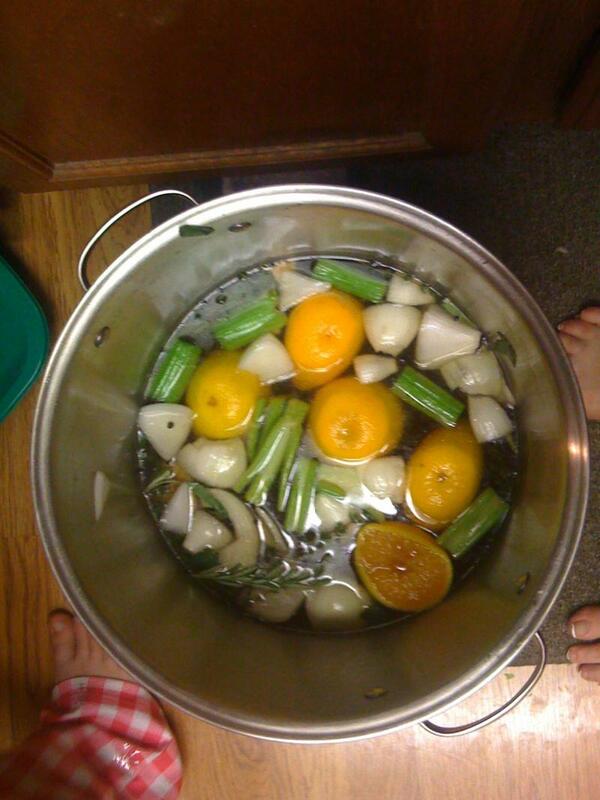 You can also add anything else you may have such as a couple of rough cut oranges, carrots, and/or celery. So I use a huge stock pot but I start with my bouillon and mix the ice water and salt. You don't want the bird going into warm water. When the water was cool add the turkey, then add the other seasonings (whole pepper corns, hand torn herbs, cut the garlic and onions in half and throw those in). I put the lid on it and put it in my garage where it stays cool. Then when I go to cook it, I pull the turkey out of its bath and rinse it well. If you don't, it will be very salty, so make sure to rinse inside and out (for about 5 minutes) before preparing. I don't worry about flipping my turkey upside down, putting it in a bag or basting it to keep it juicy. My turkey is super moist and flavorful because the day before I will make up compote (flavored butter) which I use. I will soften butter and add seasoning to it (usually oregano, sage, thyme and marjoram) and when it is well mixed, I will put it in the freezer in a ziplock bag, pushing it to the bottom. It then goes into the freezer until it is hard and I am able to then cut it into medallions. After my turkey is well rinsed, I will then separate the skin from the bird. To do this you need to carefully run your hands from the opening of the neck, under the skin, and just separate the skin as much as possible. I then take those coined shaped butter pieces and push them between the skin and meat of the turkey. This also means that you may have to slice the skin to the legs to put butter in there too; however, if you brined the turkey, you shouldn't need to do that. When I am done I will also rub the butter to the top of the turkey and salt and pepper it. This will leave the skin crispy and delicious. I say forget the stuffing and make dressing. I make dressing (which is the same thing only it never goes into the carcass). Instead, I put herbs (the all mighty poultry combo of sage, majoram, thyme, and oregano) as well as onions, celery, carrots, and occasionally fruit into the bird. This helps to add flavor and moisture to the bird. I will even add some chicken stock to the pan as well. If you opt to stuff your bird you may find that in order to get the stuffing cooked so there is no concern about salmonella, that you over cook your turkey. And the stuffing also absorbs the juice that the turkey needs. All in all, skip the stuffing and instead go with mirepoix and stuff the bird with much of the same things you put inside your brine. So rough chop herbs, onions, garlic, celery, carrots, and even fruit and shove it in there to add extra flavor and juice. Most importantly, you do not need to baste the turkey, or check on it a bunch, so leave it alone. Cook the bird uncovered for about 30 minutes at 500 degrees until it turns brown. Then cover the breast with foil so it does not burn and lower the oven temperature to 300 degrees and cook the turkey until done. I know there are lots of people that will say it takes so long for so many pounds; however, at about 90 minutes I will take the temp and see. When you pull it out and let it rest for 10 minutes at least (because it will obviously be very tired from a busy day) the temperature will rise another 10 degrees, so make sure to not over cook it. The letting it rest (which means no cutting poking or molesting it in any way) also lets the juices resettle, if you cut the turkey right away, the juice will escape leaving your bird drier. There are several ways I make my gravy. One way is to drain the juice from the turkey in the pan (my roasting pan can go on the stove) and with the giblets I pour 1 c of red wine into the pan and then wisk the bits off the bottom of the pan. I will add 2 c of unsalted chicken stock, 2 tbs of cornstarch and whisk well. I will then strain the liquid and put it in a sauce pan with 1 tbsdijonmustard and cook. THE EASIEST GRAVY- Another way is similar but I make a rue (melt butter in a sauce pan and add flour to it until it becomes a thick glob of yellow mush) and add the liquids (being the wine and grease) to it. You can then strain the chunks out of it and use that grease strainer if you wish. This is a much less temperamental way to make gravy, plus it is very easy to do. crust and added the leaves and pecan decoration. 1. Combine pumpkin, apple juice, spices, and sugar in a large saucepan; stir well. Bring mixture to a boil. Reduce heat, and simmer for 30 minutes or until thickened. Stir frequently. 2. Transfer to sterile containers and chill in the refrigerator until serving. Grease and flour three 7 x 3 inch loaf pans. and spices. Add to the pumpkin mixture, and mix until just combined. Stir in nuts and raisins. Divide batter into prepared pans. Bake for 1 hour. Cool on wire racks. Pierce Sweet Potaotes and bake for 10 min at 375 degrees. Add bananas (in peels) and bake for another 20. They should then be soft enough to mash together. In a seperate bowl, put butter, sugar, flour together and mix with your hands. Mix it until it looks like wet sand, then you can chop nuts (if desired and fold them in). Dish the mash as desired and sprinkle it with the topping (which tastes a lot like chocolate chip cookie dough).